Na Hong-Jin’s The Yellow Sea was chosen as the closing film of this year’s New York Asian Film Festival, which wrapped up this week in New York City. Na Hong-Jin’s The Chaser, which was released in 2008 in South Korea, came onto the scene like a lightning bolt. Korean film was starting to get international attention for filmmakers like Park Chan-Wook and Bong Joon-Ho, but receipts were middling at home, as well as critical attention. But Mr. Na changed it all with his deceivingly simple cat and mouse game between a former detective and a serial killer. It failed to break any boundaries in terms of reinventing the genre, but with its quick pace and uniquely reserved tone, it became a smash hit at home and received a deserving cult following in the United States. Now comes his more explosive epic, The Yellow Sea. The film is bigger in every way, no doubt in thanks to the fact the bill was footed by 20th Century Fox, hoping for a big score in the film’s home country. But this border hopping and complex tale loses many of the elements that made The Chaser a hit. Mr. Na still shows his substance as a visual stylist, but ultimately The Yellow Sea is too grandiose that it lacks a personal touch. Those familiar with The Chaser may be thrown off at first by the film’s two stars, who have essentially revered roles. Kim Yung-Seok, who played the detective in that film, here plays the villain—a South Korean exile working at the China-North Korea-Russian border dealing in illicit goods and people. The frightening serial killer, Ha Jung-Woo, is now our hero in this story, a down on his luck cabbie with a gambling streak named Ku-Nam. Needing to take care of his debts so he can support his child and return to the wife who left him to return to South Korea, Ku-Name takes a job from Myung-Ga (Mr. Kim) to travel to South Korea and kill a man. But what starts out simple must become endlessly complex. I won’t give away how it all goes down, but things are not what they seem when Ku-Name makes it to South Korea, and he soon finds that he has been sent on a suicide mission, betrayed by all sides. And thus starts the revenge he must take, as well as the wife he hopes to track down. But there’s even more in The Yellow Sea, mainly a subplot regarding the identity of the man Ku-Nam is sent to kill, and the reasons behind it. It slowly adds up, but at running over two and a half hours, it seems needlessly tangential (a director’s cut cuts the film down to two hours and twenty minutes, but that still seems long). Mr. Na paces his film languidly, even using chapters like Quentin Tarantino did in Kill Bill. It all announces, “this is my epic, pay attention” but feels simply derisive instead of deserving. What made The Chaser work so well was its constantly moving pace and sense of tension and stakes at every moment. Because Mr. Na is in no hurry to get anywhere, The Yellow Sea feels slavishly dull at times, and its plot developments unexciting. Where Mr. Na still works is in his use of action. 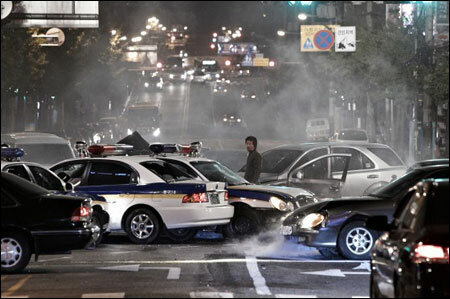 A car chase sequence in the middle of the film is messy and full of real hits and crashes instead of clean and implausible. A murder sequence early in the film builds tension straight from the Hitchcock school with a touch of Lynchian absurdity. And the knife fights (apparently no one uses in guns in South Korea) are tactfully executed without reaching excessive violent. You can expect to see Mr. Na on US shores quickly, shooting a sequel or comic book movie soon. I wouldn’t be opposed to that idea, but I hope that it’s a small project. The Chaser was a minimalist thriller, where its big moments were foot races through a hilly neighborhood of Seoul. But its genius laid in its reverence to its principles, and tightly knitted plot. The Yellow Sea has a great film in it, but it’s also surrounded by an extraordinary amount of waste.